When Gretel came to live with us she was already crate trained…or so we were told. I still had a plastic crate from when I owned a cat that was just “her size”. A crate is considered to be the right size when it’s just big enough for your dog to stand up in it and turn around. Check out this article if you want to know more about how to select the correct crate size for your dog. I put her in the crate – a “safe and secure” place – when I could not be home with her. Since I was told she was crate trained, I assumed that she would be comfortable her little cave. That didn’t work out so well. Gretel was one anxious girl. We came home a couple of times to find that she had rocked the crate out into the middle of the floor. One time we came home and she had busted the crate into two pieces, broken a nail, and bled all over the house. So much for that. It was still really important for me that she be comfortable in a crate so I didn’t give up. For one, she wasn’t any less anxious when we left her out of the crate. She chewed up quite a few things and peed around the house. My nerves and carpet couldn’t handle that. Also, it is very important to me that my Dachshunds be trained to be comfortable in a crate in case they develop back problems. Dachshunds, and other dogs with long backs, have a high tendency to develop Intervertebral Disc Disease (IVDD) that can leave them paralyzed. THE most recommended treatment, besides surgery, is “conservative treatment”. It includes a combination of medication and strict crate rest for weeks, or even months. By strict I mean that the dog is to stay in the crate at all times except to eat and go potty. I have read so many stories about how this confinement in a crate is really hard on the dog, and the owner, if the dog is not properly crate trained. Sometimes it is so bad that the owner gives up and doesn’t rest them as long as they should. Sometimes their dog continues to have back problems, and eventually may need surgery, because they never healed all of the way. I don’t want that to be my dogs. I will always make sure to train any Dachshund I own to be comfortable in a crate for this reason and I implore you to do the same. 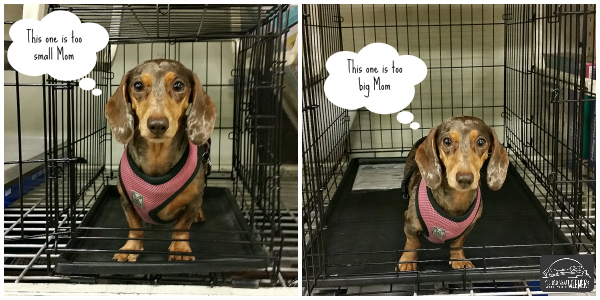 On a whim I decided to try what had worked for Chester and got Gretel an open wire, Top Paw crate from PetSmart® . We tried the “proper” size (a crate just big enough for her to stand up and turn around) but she felt it was too small. I tried a larger one but it was definitely too big. 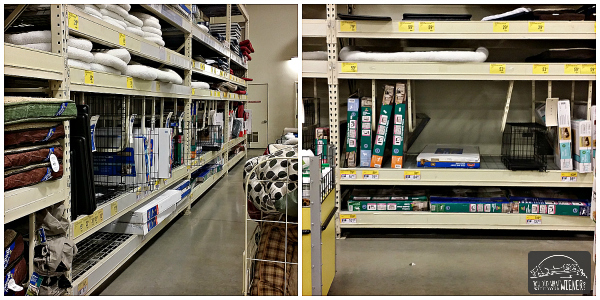 Eventually we settled on one that was large enough for a medium-sized dog. She was less anxious when she could see out of all sides. I started giving her a treat toy in the crate and now she happily runs in there when she knows I am leaving. She even chooses to sleep in there sometimes when we are home. It’s her happy, safe place now. I would like to say I am a whiz at crate training and could give you a ton of tips. I can’t though. Gretel was already somewhat crate trained when we adopted her (again, that is what we were told anyway) and the rest was just finding a mix of conditions that were perfect for her. It’s easiest crate train puppies from day 1 but it’s not impossible to train and older dog to enjoy a crate too. For tips on how to crate train your adult dog, visit our friend Ammo the Dachshund. My friend just adopted an older Dachshund and he is having separation anxiety issues when she leaves the house so I suggested she try a crate. Chester, Gretel, and I took her to PetSmart to look at them because they are having a sale on crates through the end of March. She found the perfect crate and crate pad for him and is slowly getting him familiar with it. She hopes this will help make him feel safer, and keep him out of trouble, when she is gone. I’ve found PetSmart to have one of the most reasonable prices and they carry a wide selection of crates, kennels, carriers, and accessories. If there isn’t a store near you, you can also shop online. Medical conditions are a great reason why everyone should teach their dog’s to be crate trained. Dogs with anxiety may need to try anti-anxiety treatments such as Thundershirt, pheromones or medication from your veterinarian. Yes, how you address a dog’s anxiety depends on how severe it is and the dog. Gretel was a super anxious dog. For us, the Thundershirt and pheromones didn’t work. The only thing that did was Prozac but I didn’t want to drug her up long-term. For us, the crate was a solution to her anxiety. CRATE Training #1, A+, 100% All The Way. For 30 yrs I would train my beagles the old fashion way, pee, poop, treat, may or may not work in 2 to 3 months. My aunt (dachshund lover) told me for years to crate train. I finally did with my Lucy. I got her at 5 weeks old, in 10 days she may have made 3 very mild mistakes which I caught before she finished. after the 10th day there was NO MISTAKES. My tips: start out taking the pet outside every 10 min, then 20 min, 30 min while repeating some type of command “Go tee tee.. Go tee tee” as your walking outside. wake up in the morning, “go tee tee” as you open the crate. get home from work, do the same. After Lucy’s 2nd month I left the crate door open when I was home and I left the cover on it and hung a towel half way over the door.. this was her CAVE. Kids are not allowed near it. No one allowed to call her or disturb her when she’s in her Cave. After the 3rd month she claimed her spot on the couch, Her cave was now under my bed in a plush dog bed. So I put the crate up & only will pull it out when I babysit other dogs. —- The past 9 yrs she only messed up ONE SINGLE TIME, when I had the carpet pulled up. I think she got confused with the cement.. I hope to never need a crate due to back issues, but you are right, it’s a real possibility especially for dachshunds. It’s always good to be prepared! We all hope it doesn’t happen to our pups but when it does….. How old is Ammo? You probably know this but IVDD almost always strikes between the ages of 4 and 7 if it is going to. 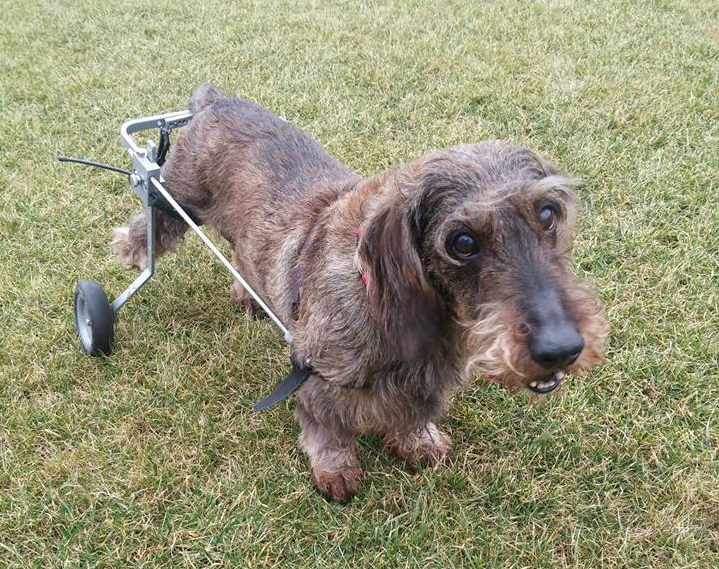 Chester is 12 and never had back problems so he is out of the woods, barring an acute back injury or age-related degeneration. Gretel is 5 so I am holding my breath with her. Interesting, I actually didn’t know there was a specific age range it was most likely to happen between. I always just thought it could happen anytime in their life span. Ammo is 6 – he’ll turn 7 in October. Fingers crossed he won’t need his crate skills for an extended stay! I try to keep him very fit and his weight at the ideal amount (20lbs for his size). And while he gets lots of exercise on the farm, he’s still a maniac when it comes to jumping off furniture. I do my best to not let him (but those dachshunds have a mind of their own) and I was hoping with the agility training it would keep his other joints & muscles strong enough to hold himself properly in the event he jumps down off something he shouldn’t. I guess only time will tell if it keeps IVDD at bay! Crate training was a must with Penny. She goes into her crate every time we leave the house because she is one sneaky girl and loves to find all sorts of weird things to chew on. Two more pieces of advice! Crate your dog even when you’re home randomly. This way your dog won’t associate it with you leaving or being gone. Place tasty snacks inside and leave the door open and let them come and go to find them in there. Play fetch in and out of the crate. Rub peanut butter on the door. Just make it a happy place. 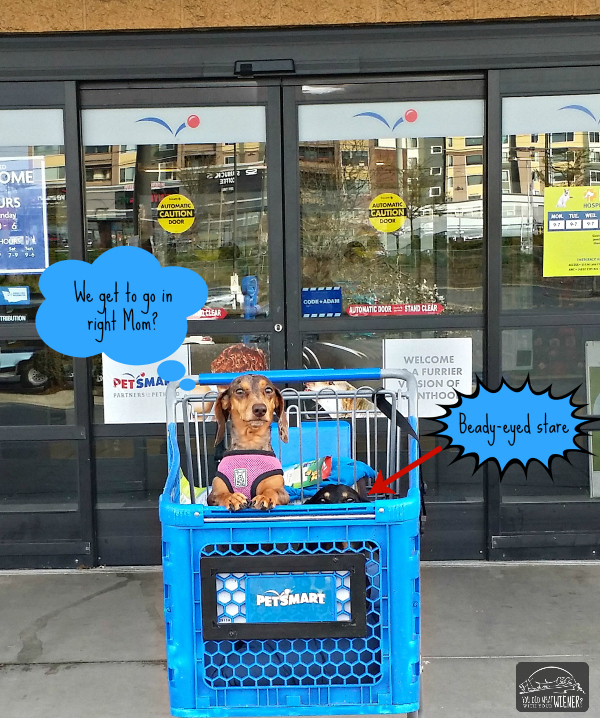 What kind of harness is Gretel wearing in the Petsmart cart? 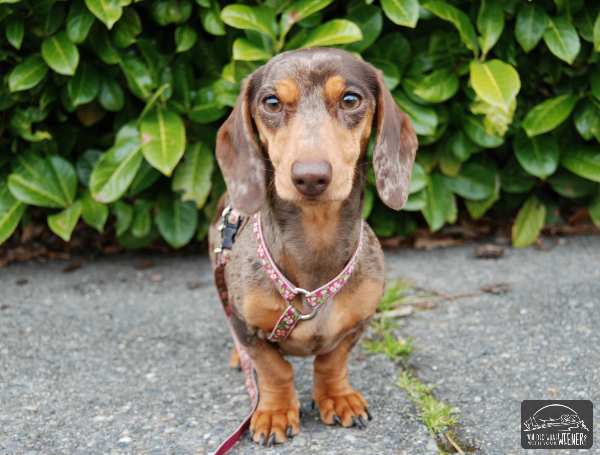 I’ve been trying to find a good harness for my two doxies.